Ref the question from the comments...The last storm came from the west but merged with a large area of subtropical moisture from the southwest. This is called by some folks the "pineapple connection" or an "atmospheric river". Clouds will start increasing later today and tonight as the next low pressure trough and frontal system approaches the coast. 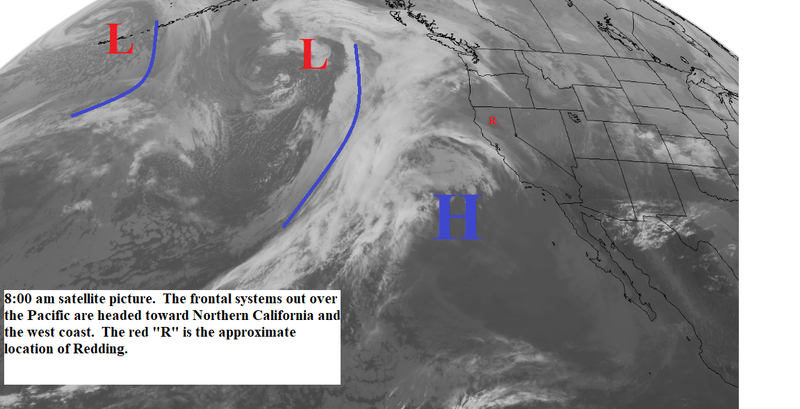 We are still in a weather pattern, and will stay there for the next week, where the jetstream runs across the Pacific and over Northern California. The Tuesday system will bring light rain to Northern California with snow levels 6000 feet or higher. It will be followed by a slightly stronger storm on Wednesday with snow levels dropping to around 5000 feet in the north (see map below). Thursday we will have partly cloudy skies with a few showers mainly over the higher elevations. Friday and most of Saturday the north state will be sunny with above normal temperatures and then Sunday and Monday the next storm reaches the coast.